Read them online or download an insert for your book. Changes to Edition 4 that appear in Edition 5. VGOG Edition Five contains these changes to the gun laws from the 2002 legislature. Link to the state site for a description of the bill and a copy of the bill text. The necessary changes are incorporated throughout the new fifth edition. Pages with a D below indicate the new law only affected Appendix D, the copy of the statutes, and not the text of the book. H0118 ...... 59.1-148.3 ...... D ...... Retired cops buy service guns for $1. VGOG Edition Five contains these changes to the gun laws from the 2001 legislature. Link to the state site for a description of the bill and a copy of the bill text. The necessary changes are incorporated throughout the new fifth edition. Pages with a D below indicate the new law only affected Appendix D, the copy of the statutes, and not the text of the book. Price ($14.95) and page count (256) remain the same. For an order form, click here. Minor adjustments in pagination, grammar and other subtleties are not noted. Virginia's gun laws grew in 2000 by 6.7%, to a total of 36,486 words. 2 Now the 4th edition, ISBN 1-889632-06-6, copyright 2001. 3 Table of contents updated as needed. 20 There are now 88,584 words of federal gun law. 28 Û22.1-277.01 now includes school vehicles as school grounds. Û22.1-280.1 now includes incidents of carrying explosives or shooting of a person, while on school property, bus or activity. 29 School firearm incident reports must now be released to the public, in addition to the department of education. Information on certain offenses in addition to firearms may be released by school officials under relaxed requirements, for police/school data sharing, and staff has limited immunity in making such reports. 30 Dealers must now agree to state approval and taxation in addition to federal controls and taxation in order to transfer firearms to the public. 41 The reciprocity info is updated and a sentence is added: "Instead of a protected right to keep and bear arms, your rights as an American have been reduced to a short list of government approved states for licensees only, under the infringement of reciprocity schemes." 42 Under Û19.2-120, bail can be denied in gun-related incidents. 57 Your social security number cannot be legally placed (Û18.2-308) on your carry permit (but it has reportedly been done in some places). 72 Note that the phrase "explosive material" is defined under Û18.2-85 to include "gunpowder" (a word usually reserved to connote "black powder," a mixture of sulfur, charcoal and potassium nitrate, which is an explosive) and to "smokeless powder," (a nitrocellulose compound which is a propellant, not an explosive, used in most modern cartridge ammunition). Fire Services Board regulations, and the Fire Prevention Code, under Û27-97, regulate the handling, storage and use of "explosives or blasting agents." 84 Cities and counties have an exemption for taking of nuisance deer under Û29.1-529. Affects both Û15.2-1113 and Û15.2-1209. 109 A note is added at the end of the Deadly Force and Self Defense chapter. "Many factors make relying on the legal argument of self defense a risky business. Yes, it is the law, and people are acquitted under it, but remember that justice is not always served. Remember that you are only justified if the authorities or a jury agree, after the fact, that you were justified. Remember that a prosecutor's role is to work hard to convict, regardless of your guilt or innocence. The pursuit of high conviction rates may lead to what some would consider dirty lawyer tricks, with your fate on the line. Months and even years can pass with your freedom hanging in the balance. Popular folk wisdom says it's better to be tried by twelve than carried by six, and there's another old saying that also has some merit here, 'Better a criminal goes free than a lien on your home.' It is admittedly a very tough and risky choice." 113 Lasers. Shining a laser or simulated laser on a peace officer, as defined in Û18.2-57.01, is a class 2 misdemeanor. Use of Force by Teachers. Assault charges do not apply to a teacher, acting in an official capacity, who uses reasonable and necessary force in self defense, defense of others, or to disarm students (Û18.2-57). 131 FBI fingerprint cards are reportedly saved until the applicant reaches 99 years of age. 132 Although a national firearms registry is against the law, authorities are increasingly able to easily determine which people have chosen to own firearms. 135 The Justice Dept. was unsuccessful in its attempt to levy a tax on Brady background checks. 137 This section is tuned to meet current situation. The Brady Law Part 2-National Instant Check: The Brady Law requires the U.S. Attorney General (AG) to establish a National Instant Criminal Background Check system (NICS) before Nov. 30, 1998 (which they did). With NICS now in effect, the previous process (now listed in small type) is eliminated. NICS provides no notice that the transfer would violate relevant laws. Virginia has been designated a "Point of Contact" state by the FBI. This means that dealers here contact the State Police for all gun sales, as they have been doing for years. The instant check then automatically includes a check of the federal NICS system, and the process is transparent to Virginia's buyers. In most states, the dealer must contact the FBI directly. The NICS system is required to issue the transfer number if the transfer would violate no relevant laws, and it is supposed to immediately destroy all records of approved inquiries except for the identifying number and the date it was issued. The FBI, however, has decided to record the name and address of everyone who buys a gun now that the system is running, and Congress has been unable to stop them so far. If the transfer is approved, the dealer includes the transfer number in the record of the transaction (on a redesigned version of the 4473 form). The NICS system is bypassed under conditions similar to 2, 4 and 5 listed above (in small type) as exceptions to the Brady process (with number 2 broadened to include "firearms" permit). A licensed dealer who violates these requirements is subject to a civil fine of up to $5,000 and suspension or revocation of their license, but only if the system is operating and would have shown that the customer would have been ineligible to make a purchase (as set forth in 18 USC 922(t)(5)). 139 The final FBI NICS regulations have been published and are posted on our website at gunlaws.com. A person under a domestic violence restraining order is barred from purchase or possession of firearms. 146 An updated chart on the growth of federal gun law shows a 5,000-word increase from 1996 to 1999. The last federal gun law passed in 1999, an omnibus bill that by itself increased federal gun law 6%, has provisions for NICS funding, gun-law enforcement funding, gun safety devices sold at retail, public gun safety training funding, restrictions on aliens, NICS record-keeping and tax prohibitions, shotguns and certain antiques redefined, undetectable gun law reenactment, relief for importers, a pawn shop NICS glitch fix, the Arms Control and Disarmament Agency disbanded with duties moved to the State Dept., and a special ban on using the U.S. global arms control and disarmament agenda against the public. 185 Appendix D. The laws are updated through 2000. Link to the latest statutes on our website, gunlaws.com. The bills responsible for the changes in this update are listed below. "´" indicates effects Appendix D only (no change to book text). The Virginia legislature was active on gun issues in 1998 and 1999, increasing Virginia gun law by 4.4% and 5.8% respectively, to a new total of 34,184 words of gun law. The results are summarized below, and are contained in their entirety in edition 3 of The Virginia Gun Owner's Guide. 3--The Table of Contents was updated as needed. 11--In the first line of the second full paragraph, change "state laws" to "statutes," for precision. 13--This is now the Third Edition. 14--Change "citizens" to "people," for precision. 18--Tweak the language describing constitutional amendment to comport with our other gun owner guides. 19--Statutes renumbered: §15.1 is now §15.2, §17.1 is now §17.2. 23--Item 6, add a court order against stalking to list of prohibitions. 26--Juveniles must make at least partial restitution for harm done with guns under §16.1-278.8. Merely having a gun on the premises of a public or private elementary, middle or high school is a class 6 felony under §18.2-308.1. School buses are included, as is any property used for school-sponsored functions while the function is taking place. Possession of other types of weapons such as knives with a metal blade three inches or longer, tasers, brass knuckles or blackjacks is punishable as a class 1 misdemeanor. Unloaded firearms in a closed container in a motor vehicle and unloaded rifles and shotguns in the firearm rack of a motor vehicle are allowed under this law. Also allowed are weapons in a school-sanctioned program. With regard to knives, exceptions are made for food utensils as long as they're used that way, blades used for business purposes, knives in vehicles, or as part of school activities or approved programs, and for the proper authorities. Under §22.1-277.01, a student who has a firearm on school property or at school sponsored activities may be expelled for one year. This statute uses an expanded definition of firearms to include the frame or receiver of a firearm, a silencer or any destructive device. Other discipline, or no action, may be taken at the discretion of school officials, and school boards may establish their own guidelines. Possession of a firearm as part of a school-sponsored program is allowed. Unloaded, cased firearms in a motor vehicle and unloaded rifles and shotguns in the firearm rack of a motor vehicle, a formerly legal and widely used exemption under this law, was outlawed in 1999. At the same time, school officials were given more discretion in taking action, or not, towards students. The result is that the familiar motor vehicle exemptions protect you against criminal charges under §18.2-308.1, but students could be expelled, subject to school board policy, under §22.1-277.01. Any county, city or town may prohibit any shooting, hunting or carrying loaded firearms while hunting, within 100 yards of a school, as a class 4 misdemeanor under §29.1-527. Before admitting a student to a public school, the school board must require the parent or guardian to provide a sworn statement indicating whether the student has ever been expelled from a public or private school for a firearm offense. Making a false statement is a class 3 misdemeanor under §22.1-3.2. The document becomes part of the student's permanent record. In addition, the superintendent of a school division is notified by the authorities, as soon as possible by phone, when a juvenile is charged with a serious gun crime (§16.1-260), and in writing within 15 days, by the court clerk, when a juvenile is found delinquent or guilty of a serious firearm offense (§16.1-305.1). All incidents involving illegal carrying of firearms on school property must be reported to the office of the principal, under §22.1-280.1. All such reports must be submitted to the school's division superintendent. The superintendents are required to file annual firearm incident reports to the Dept. of Education. A division superintendent who knowingly fails to comply and make others comply faces sanctions described in §22.1-65. Protection over juvenile criminal information is relaxed in cases where firearm offenses are involved, so that police and school principals can share information and make reports required by law (§22.1-280.1). A judge may release the name of a juvenile over 14, if charged with a weapon-related offense that would be a felony for an adult, see §16.1-309.1. A juvenile who uses a gun to knowingly attack a teacher or other school personnel faces a mandatory minimum six-month sentence of confinement, as required by §18.2-57. Introduced in 1999, schools must now have written emergency plans for dealing with a long list of natural and instigated disasters, including criminal attacks and threats with firearms and other weapons, see §22.1-278.1. 30--Paragraphs rearranged for better continuity. 33--The FBI's National Instant Background Check (NICS) is now part of the Virginia Instant Check system. 35--You can buy and take possession of a long gun out of state if the sale is legal and face-to-face with a licensed dealer. 38--Additional observation regarding interstate travel: The chilling conclusion is that the Constitution no longer constrains law-making as it used to, and the government has rights to travel that the people do not. 41--Firearms must be legal at your destination to transport them by common carrier. While it's legal to give custody of firearms to specified authorities on common carriers, those individuals are not required to accept custody. 42--You can be barred from having a gun as a condition of release on bail, under §19.2-123. 43--§15.1-133.01.1 is now §15.2-1721 (guns unclaimed for more than 60 days). 50--Passed in 1999, it is now legal to carry concealed in your place of business without a permit. 54--Police with permits can carry concealed while on duty at restaurants or clubs where liquor is served. 55--You cannot reapply for a permit for five years if it is revoked for carrying while intoxicated or on illegal drugs. --Qualification for a permit includes current military service or an honorable discharge. 56--The correct citation for item 1 is §18.2-308.1:1. 57--Disqualification includes conviction for possession or distribution of illegal drugs in the prior 3 years. 57--The carry permit application requires your social security number, but it cannot be put on the permit itself. 58--§17-47.4 is now §17.1-213; §17-116.05.1 is now §17.1-406. Appeals to the Court of Appeals can be made within 60 days (formerly 30). If you are denied a permit renewal, you are entitled to a formal hearing. 59--In 1999, the State Police were authorized by law to charge fees to federal agencies (except for the FBI) for access to the VCIN system. According to the Virginia legislative website, 76 federal agencies currently have access to VCIN information (where permit holders are listed). 61--The growth of prohibited places has given rise to the phrase "infringement creep." 65--Carry without a permit is now allowed in your own business. 73--NFA weapons, destructive devices and 'prohibited' weapons are frequently but inaccurately called illegal guns (special conditions apply to their ownership and possession). Guns with a bore greater than one-half inch (except regular shotguns) are technically known as destructive devices. §15.2-917. Prohibits holding a shooting range to noise control standards more restrictive than the ones in place when construction of the range was approved. The effect of this statute is to protect ranges from being "zoned" out of business by changing noise ordinances. §15.2-918. Allows any locality to control air cannons and similar loud explosive devices designed to repel birds. §15.2-1113. Allows municipal corporations to regulate or prohibit: 1-any dangerous, offensive or unhealthful business, trade or enterprise (these and other terms of this law are not specifically defined); 2-transportation of any offensive substance; 3-the manufacture, storage, transportation or possession and use of any explosive or inflammable substance; 4-the use and exhibition of fireworks; and 5-the discharge of firearms. Also allows such cities to require safety devices on storage equipment for such items. §15.2-1206. Allows the governing body of any county to impose a license tax of up to $25 on a handgun dealer. §15.2-1207. Allows counties to require sellers of handguns to report the sale to the clerk of the circuit court. The report may require the name and address of the buyer, the date of purchase, and the number, make and caliber of the handgun. The county may require the report within ten days of the sale, and the court clerk must keep a record of the reports. §15.2-1208. Continues in effect the law known as Chapter 297 of Acts of 1944 that requires permits to sell or buy handguns in any county with a population density of more than 1,000 people per square mile. Currently, this appears to affect only Arlington and Fairfax counties. 89--The city examples provided are as of 1998. 93--The local ordinance samples are as of 1998. 99--Tweak the language describing use of deadly force to comport with our other gun owner guides. --Using lethal force is so risky legally it is yet another reason to avoid it if at all possible -- for your own safety. --On the cover of this book is the question, "When can you shoot to kill?" The unasked part of the question is, "...and expect to be justified under the law." You cannot know this ahead of time. --An argument can be made against the whole notion of shoot to kill on moral and legal grounds. In a true self-defense case, your goal -- your intention and mental state -- is not to kill, but to protect. Shoot to stop, or shoot to neutralize the threat, are other ways of saying it. --Shooting at another human being is a last resort, reserved for only if and when innocent life truly depends on it. If it doesn't, don't shoot. If it does, don't miss. 108--Although deadly force can be used in certain instances involving violent felonies, remember than an act is a "violent felony" only after a court says it is. 110--Discharging a firearm in a public place becomes a class 6 felony if bodily injury results. 126--It's illegal to possess a firearm while helping others to hunt, if prior to the hunt you reached certain season limits (§29.1-521). 133--Federal gun laws now include: Omnibus Consolidated Appropriations Act for FY 1997 (Domestic Violence Gun Ban, Gun Free School Zones); Omnibus Consolidated & Emergency Supplemental Appropriations Act, 1999 (numerous requirements detailed later in this update). A mechanism for preventing known criminals from directly purchasing firearms at retail and paying sales tax. The widely publicized five-day waiting period was largely a myth, and never existed in most states (Virginia never had one). The effect of the Brady law on crime reduction is essentially unknown, since the 250,000 criminals reportedly identified by the system (the number is hotly disputed) are on the loose -- virtually no effort to track or apprehend them has been made. It is a five-year federal felony for criminals and other disqualified persons to attempt to purchase a firearm. Part 1 of the law, the handgun part, expired 60 months after enactment, and is now described in the book text in small type (it expired Nov. 30, 1998). Brady Part 2, the National Instant Background Check (dubbed NICS by the FBI, who has replaced BATF to operate the system), controls rifles, shotguns and handguns, and is described as it appears in the federal statute. Complex regulations to implement the new law, which are basically transparent in this state, are not covered (available in their entirety on the FBI and BATF Internet sites). The FBI's use of the Brady NICS computer system to record the name and address of every retail gun buyer in America, in apparent violation of long-standing law (strictly forbidden in both the McClure Volkmer Act, 1986, and the Brady law itself), has prompted outcries from the public and Congress, but continues unabated. In addition, the Justice Dept. seeks to levy a tax on the sale of firearms, and give the funds to the FBI, with no apparent authority to do so (taxes are supposed to originate in Congress). States that agree to cooperate with the FBI, as Virginia has done, would avoid the tax on its licensed dealers. (The tax has been temporarily stopped by Congress). For updates and detailed analysis of the complex Brady machinations, check our website, www.gunlaws.com. wait three days during which state offices are open and during which the system provides no notice that the transfer would violate relevant laws. Virginia has been designated a "Point of Contact" state by the FBI. This means that dealers here contact the State Police for all gun sales, as they have been doing for years. The instant check will then automatically include a link to the federal NICS system, and the process will be transparent to Virginia's buyers. In most states, the dealer must contact the FBI directly. The NICS system is required to issue the transfer number if the transfer would violate no relevant laws, and it must destroy all records of approved inquiries except for the identifying number and the date it was issued. The FBI, however, has indicated they are recording the name and address of everyone who buys a gun now that the system is running, and Congress has been unable to stop them so far. If the transfer is approved, the dealer includes the transfer number in the record of the transaction (on a redesigned version of the 4473 form). The NICS system is bypassed under conditions similar to 2, 4 and 5 listed as exceptions to the Brady process (with a permit such as Virginia issues for concealed carry, with a background check such as Virginia uses, and in places so remote that checks are impossible (no such places exist). (VGOG editions 2 and 3 have details on p. 136). A licensed dealer who violates these requirements is subject to a civil fine up to $5,000 and suspension or revocation of their license, but only if the system was operating and would have shown the customer would have been ineligible to make a purchase. If you are denied a firearm under NICS, the law says you may request the reason directly from NICS and it must present you with a written answer within five business days. You may also request the reason from the AG, who must respond "immediately," according to the law. You may provide information to fix any errors in the system, and the AG must immediately consider the information, investigate further, correct any erroneous federal records and notify any federal or state agency that was the source of the errors. 139--Item 2 should say "Possession" not "Purchase" for people under a domestic violence restraining order. 142--The full name of the act described is "Omnibus Consolidated Appropriation Act for 1997." --In effect, the Gun-Free School Zones law criminalizes the actions of nearly anyone who travels in a populated area with a legally possessed firearm, creating millions of federal offenses every day. In stark contrast, none of the 6,000 students who brought weapons to school in 1997 were prosecuted. 143--A number of narrow conditions may exempt people from this law, including whether they were represented by an attorney, the type of trial and plea, an expungement or set aside, or a pardon or other restoration of civil rights. Because courts-not-of-record often handle such offenses, such determinations may not be possible. The current congressional practice of placing unrelated laws in larger acts, to get them passed without debate (or unnoticed), has raised concerns among many observers. This law, known as the Lautenberg amendment, is an extreme example. It caught both firearms-rights advocates and adversaries by surprise. The law is drafted broadly, affecting sworn police officers nationwide, the armed forces, and agencies such as the FBI, CIA, Secret Service, Forest Service and others, most of whom are accustomed to being exempted from such laws. Many of these groups are currently battling to get themselves exempted from the law. They don't believe they should be prevented from defending themselves or others because of prior minor infractions. Some police departments have had to lay off officers who are in violation. It denies due process, abridges the rights of U.S. citizens by state law, and denies equal protection under the law (violates 14th Amendment guarantees). Domestic violence has no single definition at the state level. Some states' laws require the arrest of at least one party if the police respond to an apparent domestic-violence report. This raises all the issues of judicial process and plea-bargaining after an arrest. A parent who pays a small fine rather than endure a long expensive trial can now face a federal felony; domestic violence pleas have been a standard ploy in divorce proceedings for decades; these charges now deny your right to keep and bear arms, to vote, to hold office and more. An analogy to cars crystallizes this law's affects. It is as if a former speeding ticket were now grounds for felony arrestæif you own a car or gasoline. When a law is scrutinized for constitutionality it is typically held up to a single constitutional provision. The eight constitutional issues in this short piece of legislation may set a record. 143--Omnibus Consolidated & Emergency Supplemental Appropriations Act, 1999. This 4,000-page budget bill was secretly drafted in committee, rushed to the floor of Congress, voted on two days later, and enacted in October 1998 without any of your representatives actually reading it. It increased federal gun law by almost 6%, with provisions for NICS funding, gun-law enforcement funding, gun safety devices sold at retail, public gun safety training funding, restrictions on aliens, NICS record-keeping and tax prohibitions, shotguns and certain antiques redefined, undetectable gun law reenactment, relief for importers, a pawn shop NICS glitch fix, the Arms Control and Disarmament Agency disbanded with duties moved to the State Dept., and a special ban on using the U.S. global arms control and disarmament agenda against the public. 189--The statutes in Appendix D have been brought up to date through the end of the 1999 Virginia legislative session, with changes made throughout. Don't Take Chances With Partial Or Out-Of-Date Info - Get The Latest Edition of The Virginia Gun Owner's Guide! Unique -- Fun to read! -- Important information. Under the general banner of crime reduction, and citing the Brady law for its authority, the FBI has plans to tax the retail sale of handguns and long guns, starting Nov. 30, if their new computer systems are ready in time and no one stops them. The proposed tax could generate $1 million per week nationally, based on the bureau's estimates. Detailed information is included in a report just issued by Phoenix-based Bloomfield Press, a book publisher specializing in gun law [Ed. : Summary of Findings on request and website]. The FBI intends to waive the tax for any state that sets up an FBI-approved central firearms clearance center. Virginia's long-standing instant check system has been approved, placing its state police under a degree of FBI control. In other states, each dealer will have to "enroll" with the FBI to legally make a sale, and pay the tax on every purchase. The Bureau will accept credit cards or will arrange to bill dealers, and those who don't pay (or are real late on the invoice) will be literally out of business. Several authorities have indicated that they expect enough clamor from the taxed dealers to compel their states to comply. When 100 Arizona dealers were told at a government meeting in June, that they would not be taxed, they cheered, apparently oblivious to the implications of federalizing their local police. 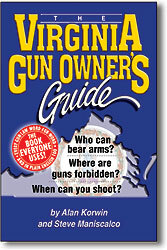 The information presented here brings the first edition of The Virginia Gun Owner's Guide (VGOG) up to date through the close of the 1997 Virginia legislative session. The basic rules for gun ownership, possession and use remained the same, but numerous subtle changes were made during the last legislature, as you can see from the information below. To determine which edition of the book you have, look at the bottom of the second page. The series of backwards numbers you'll find there is known as the print code line. The lowest number in that line is the edition number. At the time of this update, there is only one edition in print; your book will have a number "1" at the end of the line. The second edition will have a "2" as the last digit. It is scheduled for release in 1998, and may include changes not shown here. 32--The Dept. of State Police is not required to respond to dealer background checks on Dec. 25th, and that day will not be counted in determining the "dealer's next business day." 51--Unlicensed concealed carry for "the proper authorities" is expanded to include retired local law-enforcement officers who have served at least 15 years of duty, and local and state police officers who are retired for a service-related disability. 53--New concealed-handgun permits, and permit renewals, are valid for five years (formerly two years). 54--Tax limits for permits: The government may not charge you more than $50 for a total application. You may be charged up to $35.00 for the background check, which includes fees charged by the FBI. In order to curb abuses, courts are now required to accept the same payment methods used for all other fees and penalties. The tax, called a "fee," must be accepted in one payment by the person accepting the application. The tax cannot be required until the entire application is accepted. Serious problems with concealed carry in liquor-licensed facilities have been corrected. The restriction on carry in any liquor-licensed business or special event has been changed: it is illegal to carry a concealed handgun into a restaurant or club licensed to sell and serve alcohol for on-premises consumption. A club is defined as a private non-profit organization operated for a national, social, patriotic, political, athletic or similar purpose. The owner, event sponsor, or their employees may carry while on duty if they have a concealed-handgun permit. 56--Circuit Courts are required to consult with law enforcement authorities and receive a report from the Central Criminal Records Exchange in order to issue a permit; the Central Criminal Records Exchange is required to notify the court that issued your permit if you become ineligible because of any disqualifying factor. In item 7 (disqualifying misdemeanors), the three-year period has been increased to five years. 57--No form other than the one provided by the State Police can be used for a concealed-handgun permit, making the application uniform statewide. Fingerprinting for a concealed-handgun permit is not required by state law, though many localities took it upon themselves to make such a requirement. Now, §18.2-308 authorizes counties or cities to pass an ordinance requiring fingerprinting for a concealed-handgun permit if they wish. If fingerprints are required, you must submit them along with a physical description for use by the FBI through the Central Criminal Records Exchange. After the record check, the State Police must return the fingerprint card to the local agency. The local agency must promptly notify you that you have 21 days to request the return of your card. Cards not claimed within 21 days must be destroyed, as a gesture to prevent the authorities from compiling records on people who have not committed crimes. Fingerprints taken under this program may not be copied, held or used for any other purpose. It's not clear whether this state requirement is binding on federal authorities. A concealed-handgun permit shall be issued within 45 days of the application, even if the record check is not complete. The court must revoke the permit if the record check later shows the applicant is disqualified. 58--Reciprocity. Virginia has joined the national movement to establish rights for its residents when they travel outside the state, and to grant rights to others who visit the state, by adopting a state-by-state reciprocal-agreement scheme. Concealed-carry permits from other states will be valid in Virginia if: 1There is a way to instantly verify the validity of the permit 24 hours a day; 2Qualifications for the permit are "substantially similar to or exceed" the Virginia requirements, as determined at the discretion of the authorities; 3The other state has entered into an agreement to grant reciprocity to people with a Virginia concealed-handgun permit. The State Police are required to work with the Attorney General to determine if any states qualify for reciprocity. The State Police will maintain the list of states they deem qualified and make it available as part of the Virginia Criminal Information Network. It is already well known that many states will not qualify. Studying the laws of your home state (a common permit requirement) hardly prepares you for, and is typically quite different from, the laws of any other state. In such cases the authorities will have to ignore the "substantially similar" requirement to declare matches. The "meets or exceeds" requirement sounds good but is a virtual roadblock with any state that exceeds Virginia requirements, because they would meet our terms but we would not meet theirs. Texas, for example, requires a 50-shot marksmanship test, with every shot timed, and a 175 score out of a possible 250. (Virginia has no specific shooting-test requirement). A total of 49 "agreements" between the states would be required to allow Virginians to exercise their rights nationwide. To link all states to all other states under this plan would require 1,225 deals, but that number would be reduced by the number of states that have no government registration system for concealed-carry permit holders, eliminating them from possibly qualifying. Federal legislation has been introduced to grant some relief, but the idea of federally "allowed" right-to-carry, for government license holders only, has a chilling effect; and unlicensed people would have no rights under such plans. The cleanest approach may be a return to the fundamental rights, nearly forgotten, that if you have a gun, you're not a criminal, and the gun isn't illegal, then that is not a crime and there are no grounds for arrest or harassment. This has been proposed as the American Historical Rights Protection Act. 61--Item #4Concealed-handgun permit holders are prohibited from carrying a concealed handgun into any club or restaurant where alcohol is sold and served for consumption on premises. 62--Item #9 (Chesapeake)Changes have been made to the preemption statute, §15.1-29.15, to protect honest people from prosecution or conviction for transporting firearms through Chesapeake and other localities with highly restrictive laws (see below). Despite these changes, you may still be subject to arrest and have to prove your innocence at a later time. Caution is advised in such areas that do not maintain a high regard for personal rights, civil liberties and constitutional guarantees. 75--(And also on page 81) A careful analysis by Beretta Product Manager Gabriele de Plano reveals that the USAS-12 shotgun is not prohibited under Virginia law. 83--One of the more important acts of the 1997 legislative session was to strengthen the provisions of §15.1-29.15, the preemption law. While local laws may remain in place under the revised statute, such laws have had their teeth pulled. Under the new version of §15.1-29.15, a person may not be prosecuted or convicted under any local law that regulates transportation of a firearm if: 1The person lawfully possesses the firearm and has a valid concealed-handgun permit or; 2the person is otherwise transporting the firearm legally. In other words, the authorities only have domain over the criminals, not the honest people. This change to the law restores your ability to legally transport a firearm in the state by eliminating various Second Amendment "infringement traps" arbitrarily set up and run by local officials. Unfortunately, the broad protection from prosecution or conviction is no guarantee that you won't be arrested or detained for violation of a local law by local law-enforcement street patrols. 120--Item #7No license is needed for anyone aiding a disabled person who is properly licensed and hunting.  Copies of the updated statutes will be printed in Edition 2 of The Virginia Gun Owner's Guide. And from this page.  It is legal to own and wear bullet-resistant garments, but wearing such during the commission of specified crimes increases the penalties.  Other statute changes include: Extra penalty for attack of a peace officer now includes attack of a firefighter; a junior lifetime hunting license is now available; mental health reporting requirement under ß37.1-129 has been repealed.  Changed area codes in Appendix C will appear in the next edition of the book.  Send us a stamped self addressed envelope for future news about updates.